As members of the 50+ Housing Council in Raleigh, one of the things we really look forward to is sharing universal design ideas from new home builders and interior design experts. In today's market, where home owners are really focused on the areas of their homes where small changes can make a big difference, the importance of laundry room features is high on the list of "must haves." Our most requested universal design ideas make laundry chores easier - through built-in convenience that costs a lot less when you plan ahead. 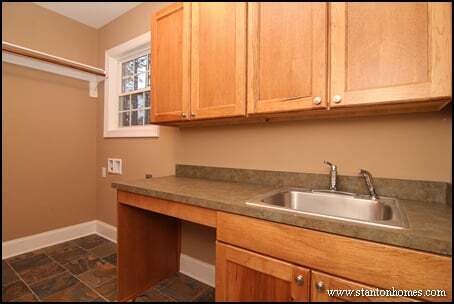 Upstairs laundry rooms are increasingly popular, since that's where most clothes congregate. 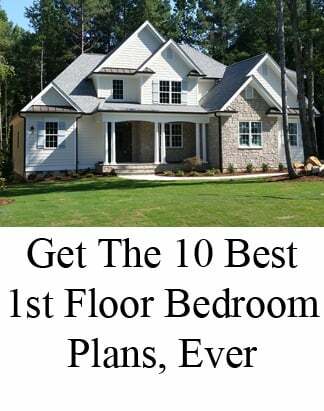 But if the master suite is on the main floor, or you'd rather have the laundry room close to the kitchen, a more traditional first floor approach might work best for your lifestyle. 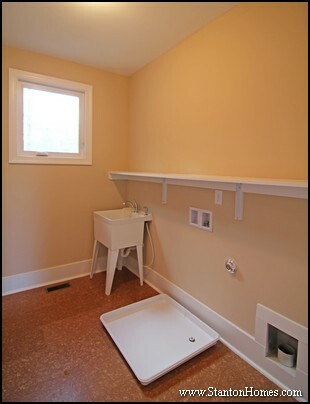 A universal design laundry room should be large enough so that anyone can use it - including someone using a mobility device. 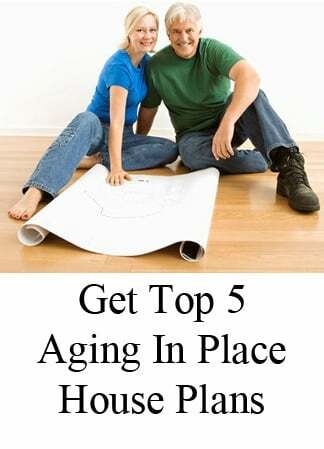 Even if you don't need that kind of accessibility now, if you plan to keep the house for a long period of time, having the capability allows for future needs - and increases flexibility for additional buyers if you decide to sell. 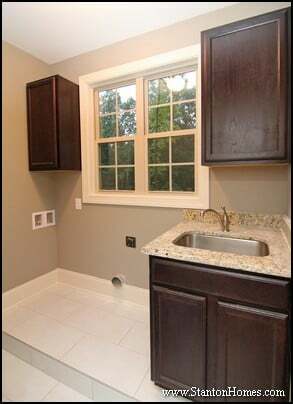 Plan to include 36" wide doorways and a 5 foot diameter open space in front of the washer and dryer where possible. 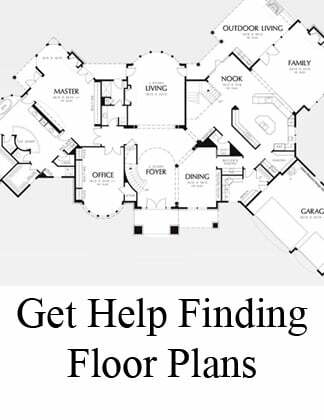 Floor plans can be adapted before a home is built, such as the plan to the right, where an additional 4" can be substituted for the traditional 2-8 drawn here. If space is at a premium, a closet laundry can be tucked into a hallway as long as the hallway is wide enough (at least 4-0 but ideally a bit wider), and opened closet doors can allow access and maneuverability. But keep that laundry on the main floor for easy access. Front loading washers and dryers are today's biggest draw. Not only do they claim to clean better, but front loaders can also be loaded and unloaded more easily - even while seated. Be aware, however, that a standard front loading washer and dryer may still require excessive bending. You may want to consider having your builder add a 12"-15" platform for the machines to sit on (like the one in this laundry room). Or you may consider purchasing a matching pedestal (like this Whirlpool set in red) to raise the equipment above the floor. 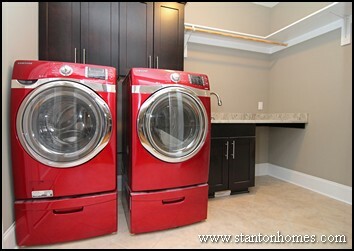 Almost every frontload washer and dryer has a platform option available. 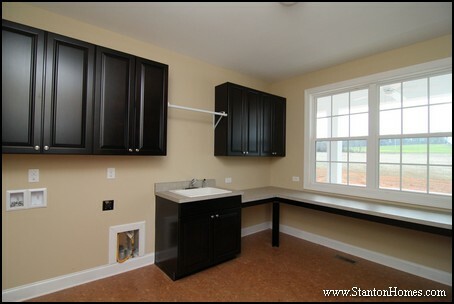 Many of today's laundry rooms are large enough to include a small countertop area. A popular option is to choose a 28 to 30" high countertop, designed for sitting while folding, in lieu of the standard height countertop that requires standing. The countertop can be multiple heights (like the one pictured above), with a lower seating area, or the entire countertop can be dropped with a combination of specially designed base cabinets and knee space areas. Make sure those seating areas are at least 36" wide, though, for full accessibility. Laundry rooms tend to be windowless, so think carefully about the amount of light you'll need. Consider motion detector lighting, for convenience when your arms are full, so the lights operate automatically when you come and go. In a room with workstations, think about adding under-cabinet lighting or other supplemental lighting. Flexible track lighting looks contemporary and can be a nice accent, particularly in a multiple use room. Choose a flooring that's easy to clean, and water resistant. One of the latest trends is to incorporate Cork flooring, which is comfortable to stand on when ironing, and naturally water resistant. Cork flooring can be considerably more expensive than most standard types of flooring, but it may be more affordable than you think since the room is typically one of the smallest in the home. 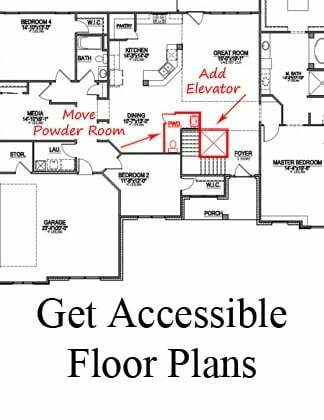 When you begin to plan your new home, talk to a new home builder experienced with universal design, who is flexible enough to meet your goals. Read more about universal design homes and commonly requested kitchen and laundry design features. 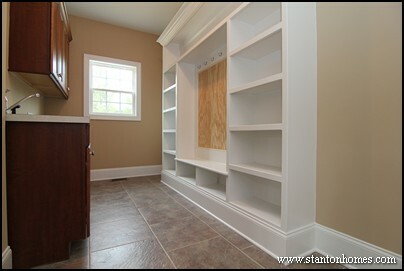 Stanton Homes builds new custom homes with universal design features throughout central North Carolina. Ask us what we can custom design/build for you.